You deserve to feel comfortable and confident about coming to visit Toothbrusher’s Dental. For those who suffer from extreme anxiety, our office offers nitrous oxide (laughing gas) as a safe and reliable way for you to feel relaxed. With extensive training in Sedation Dentistry, Dr. Guilford leads his team in offering you the most comfortable experience possible. If you have been putting off years of dental work while living in pain or with embarrassing oral problems, sedation dentistry can change your life. An intraoral camera lets you see inside your mouth during both treatment planning and dental procedures. 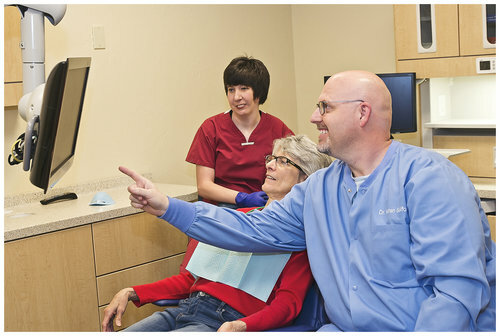 Our intraoral camera displays your teeth on a video screen, allowing Dr. Guilford to walk you through your proposed treatment. The use of this camera allows us to work with you as a team to meet your dental care goals. We are happy to answer any questions you may have and discuss your treatment options with you. We want you to picture how your appearance will improve with dental care, giving you all the more reason to smile. Digital radiographs are a technological advancement that results in less exposure to radiation for our patients and an almost instantaneous picture for our dentists. Unlike traditional, film-based x-rays, digital x-rays often show more detail and can be archived in our system for future reference and comparison. You will appreciate a more comfortable visit with less waiting and quicker treatment. For soft tissue (surgical) procedures, laser dentistry eliminates the need for suturing, giving you a much quicker, more comfortable healing time.